Available registry data from the Surveillance, Epidemiology, and End Results (SEER) database for 2011 indicate that the combined incidence of primary invasive CNS tumors in the United States is 6.4 per 100,000 persons per year, with an estimated mortality of 4.3 per 100,000 persons per year. Worldwide, approximately 256,213 new cases of brain and other CNS tumors were diagnosed in the year 2012, with an estimated 189,382 deaths. In general, the incidence of primary CNS tumors is higher in whites than in blacks, and mortality is higher in males than in females. Anaplastic astrocytomas and glioblastomas (38% of primary brain tumors). Meningiomas and other mesenchymal tumors (27% of primary brain tumors). Schwannomas, meningiomas, and ependymomas (79% of primary spinal tumors). 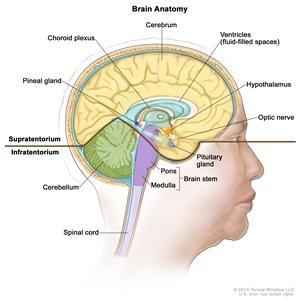 Primary brain tumors rarely spread to other areas of the body, but they can spread to other parts of the brain and to the spinal axis. Anatomy of the inside of the brain. The supratentorium contains the cerebrum, ventricles (with cerebrospinal fluid shown in blue), choroid plexus, hypothalamus, pineal gland, pituitary gland, and optic nerve. The infratentorium contains the cerebellum and brain stem. Few definitive observations have been made about environmental or occupational causes of primary CNS tumors. Exposure to vinyl chloride may be a risk factor for glioma. Epstein-Barr virus infection has been implicated in the etiology of primary CNS lymphoma. Turcot syndrome type 1 (3p21, 7p22). Turcot syndrome type 2 (5q21). Nevoid basal cell carcinoma syndrome (9q22.3). The clinical presentation of various brain tumors is best appreciated by considering the relationship of signs and symptoms to anatomy. Gastrointestinal symptoms such as loss of appetite, nausea, and vomiting. Changes in personality, mood, mental capacity, and concentration. Seizures are a presenting symptom in approximately 20% of patients with supratentorial brain tumors and may antedate the clinical diagnosis by months to years in patients with slow-growing tumors. Among all patients with brain tumors, 70% with primary parenchymal tumors and 40% with metastatic brain tumors develop seizures at some time during the clinical course. All brain tumors, whether primary, metastatic, malignant, or benign, must be differentiated from other space-occupying lesions that can have similar clinical presentations, such as abscesses, arteriovenous malformations, and infarctions. The speed of CT is desirable for evaluating clinically unstable patients. CT is superior for detecting calcifications, skull lesions, and hyperacute hemorrhages (bleeding less than 24 hours old) and helps direct differential diagnosis and immediate management. MRI has superior soft-tissue resolution. MRI can better detect isodense lesions, tumor enhancements, and associated findings such as edema, all phases of hemorrhagic states (except hyperacute), and infarctions. High-quality MRI is the diagnostic study of choice in the evaluation of intramedullary and extramedullary spinal cord lesions. In posttherapy imaging, single-photon emission computed tomography (SPECT) and positron emission tomography (PET) may be useful in differentiating tumor recurrence from radiation necrosis. Biopsy confirmation to corroborate the suspected diagnosis of a primary brain tumor is critical, whether before surgery by needle biopsy or at the time of surgical resection. Cases in which the clinical and radiologic picture clearly point to a benign tumor, which could potentially be managed with active surveillance without biopsy or treatment, are the exception. For other cases, radiologic patterns may be misleading, and a definitive biopsy is needed to rule out other causes of space-occupying lesions, such as metastatic cancer or infection. CT- or MRI-guided stereotactic techniques can be used to place a needle safely and accurately into almost all locations in the brain. DNA methylation of the O6-methylguanine-DNA methyltransferase (MGMT) gene promoter. Mutation of isocitrate dehydrogenase (IDH) 1 (IDH1) or IDH2 genes. Codeletion of chromosomes 1p and 19q. Childhood Brain and Spinal Cord Tumors Treatment Overview (treatment of brain tumors in children). Mehta M, Vogelbaum MA, Chang S, et al. : Neoplasms of the central nervous system. In: DeVita VT Jr, Lawrence TS, Rosenberg SA: Cancer: Principles and Practice of Oncology. 9th ed. Philadelphia, Pa: Lippincott Williams & Wilkins, 2011, pp 1700-49. Howlader N, Noone AM, Krapcho M, et al., eds. : SEER Cancer Statistics Review, 1975-2011. Bethesda, Md: National Cancer Institute, 2014. Also available online. Last accessed March 29, 2017. Ferlay J, Soerjomataram I, Ervik M, et al. : GLOBOCAN 2012 v1.0, Cancer Incidence and Mortality Worldwide. Lyon, France: International Agency for Research on Cancer, 2013. IARC CancerBase No. 11. Available online. Last accessed April 26, 2017. Schabet M: Epidemiology of primary CNS lymphoma. J Neurooncol 43 (3): 199-201, 1999. Behin A, Hoang-Xuan K, Carpentier AF, et al. : Primary brain tumours in adults. Lancet 361 (9354): 323-31, 2003. Cloughesy T, Selch MT, Liau L: Brain. In: Haskell CM: Cancer Treatment. 5th ed. Philadelphia, Pa: WB Saunders Co, 2001, pp 1106-42. Hutter A, Schwetye KE, Bierhals AJ, et al. : Brain neoplasms: epidemiology, diagnosis, and prospects for cost-effective imaging. Neuroimaging Clin N Am 13 (2): 237-50, x-xi, 2003. Ricci PE: Imaging of adult brain tumors. Neuroimaging Clin N Am 9 (4): 651-69, 1999. Tumor size (T) is less relevant than are tumor histology and location. Nodal status (N) does not apply because the brain and spinal cord have no lymphatics. Metastatic spread (M) rarely applies because most patients with CNS neoplasms do not live long enough to develop metastatic disease. WHO grade I includes lesions with low proliferative potential, a frequently discrete nature, and the possibility of cure following surgical resection alone. WHO grade II includes lesions that are generally infiltrating and low in mitotic activity but recur more frequently than do grade I malignant tumors after local therapy. Some tumor types tend to progress to higher grades of malignancy. WHO grade III includes lesions with histologic evidence of malignancy, including nuclear atypia and increased mitotic activity. These lesions have anaplastic histology and infiltrative capacity. They are usually treated with aggressive adjuvant therapy. WHO grade IV includes lesions that are mitotically active, necrosis prone, and generally associated with a rapid preoperative and postoperative progression and fatal outcomes. The lesions are usually treated with aggressive adjuvant therapy. a Reprinted with permission from Louis, DN, Ohgaki H, Wiestler, OD, Cavenee, WK.World Health Organization Classification of Tumours of the Central Nervous System. IARC, Lyon, 2007. Recently discovered alterations in the BRAF and isocitrate dehydrogenase (IDH) 1 and IDH2 genes, and genomic 1p/19q codeletion, appear to be hallmark aberrations in particular glioma subtypes. Assessment for the presence of these mutations aids diagnosis and prognosis and, with regard to 1p/19q codeletion, predicts for response to chemotherapy. In pilocytic astrocytomas (WHO grade I), tandem duplication at 7q34 leading to a fusion between KIAA1549 and BRAF is found in approximately 70% of pilocytic astrocytomas. [6,7,8] An activating point mutation in BRAF (V600E) is found in an additional 5% to 9% of these tumors and in general, RAF alterations occur in approximately 80% of pilocytic astrocytomas. The majority of WHO grade II and III diffuse gliomas (astrocytomas, oligodendrogliomas, and oligoastrocytomas) and 5% to 10% of glioblastomas (WHO grade IV) harbor point mutations in the R132 position of (IDH1) or, rarely, the analogous codon in IDH2 (R172). [12,13,14,15,16] The presence of an IDH1 or IDH2 mutation is a strong prognostic factor. Patients with these mutant tumors have significantly longer survival independent of WHO grade or histologic subtype. These genetic alterations have potential diagnostic utility. Presence of the IDH1 and IDH2 mutations may distinguish diffuse gliomas from other glioma variants, which often have BRAF genetic alterations, and non-neoplastic reactive astrocytosis. Most (90%) IDH mutations in gliomas result in an R132H substitution, which can be detected with a highly sensitive and specific monoclonal antibody. A rapid immunohistochemical analysis using the mutant-specific IDH1 antibody can aid diagnostic analysis. Other CNS tumors are associated with characteristic patterns of altered oncogenes, altered tumor suppressor genes, and chromosomal abnormalities. Familial tumor syndromes with defined chromosomal abnormalities are associated with gliomas. Brain and spinal cord. In: Edge SB, Byrd DR, Compton CC, et al., eds. : AJCC Cancer Staging Manual. 7th ed. New York, NY: Springer, 2010, pp 593-7. Kleihues P, Burger PC, Scheithauer BW: The new WHO classification of brain tumours. Brain Pathol 3 (3): 255-68, 1993. Sievert AJ, Jackson EM, Gai X, et al. : Duplication of 7q34 in pediatric low-grade astrocytomas detected by high-density single-nucleotide polymorphism-based genotype arrays results in a novel BRAF fusion gene. Brain Pathol 19 (3): 449-58, 2009. Pfister S, Janzarik WG, Remke M, et al. : BRAF gene duplication constitutes a mechanism of MAPK pathway activation in low-grade astrocytomas. J Clin Invest 118 (5): 1739-49, 2008. Jones DT, Kocialkowski S, Liu L, et al. : Tandem duplication producing a novel oncogenic BRAF fusion gene defines the majority of pilocytic astrocytomas. Cancer Res 68 (21): 8673-7, 2008. Dias-Santagata D, Lam Q, Vernovsky K, et al. : BRAF V600E mutations are common in pleomorphic xanthoastrocytoma: diagnostic and therapeutic implications. PLoS One 6 (3): e17948, 2011. MacConaill LE, Campbell CD, Kehoe SM, et al. : Profiling critical cancer gene mutations in clinical tumor samples. PLoS One 4 (11): e7887, 2009. Parsons DW, Jones S, Zhang X, et al. : An integrated genomic analysis of human glioblastoma multiforme. Science 321 (5897): 1807-12, 2008. Yan H, Parsons DW, Jin G, et al. : IDH1 and IDH2 mutations in gliomas. N Engl J Med 360 (8): 765-73, 2009. Dubbink HJ, Taal W, van Marion R, et al. : IDH1 mutations in low-grade astrocytomas predict survival but not response to temozolomide. Neurology 73 (21): 1792-5, 2009. Sanson M, Marie Y, Paris S, et al. : Isocitrate dehydrogenase 1 codon 132 mutation is an important prognostic biomarker in gliomas. J Clin Oncol 27 (25): 4150-4, 2009. Hartmann C, Hentschel B, Wick W, et al. : Patients with IDH1 wild type anaplastic astrocytomas exhibit worse prognosis than IDH1-mutated glioblastomas, and IDH1 mutation status accounts for the unfavorable prognostic effect of higher age: implications for classification of gliomas. Acta Neuropathol 120 (6): 707-18, 2010. Hartmann C, Meyer J, Balss J, et al. : Type and frequency of IDH1 and IDH2 mutations are related to astrocytic and oligodendroglial differentiation and age: a study of 1,010 diffuse gliomas. Acta Neuropathol 118 (4): 469-74, 2009. Jenkins RB, Blair H, Ballman KV, et al. : A t(1;19)(q10;p10) mediates the combined deletions of 1p and 19q and predicts a better prognosis of patients with oligodendroglioma. Cancer Res 66 (20): 9852-61, 2006. Camelo-Piragua S, Jansen M, Ganguly A, et al. : A sensitive and specific diagnostic panel to distinguish diffuse astrocytoma from astrocytosis: chromosome 7 gain with mutant isocitrate dehydrogenase 1 and p53. J Neuropathol Exp Neurol 70 (2): 110-5, 2011. Capper D, Weissert S, Balss J, et al. : Characterization of R132H mutation-specific IDH1 antibody binding in brain tumors. Brain Pathol 20 (1): 245-54, 2010. Radiation therapy and chemotherapy options vary according to histology and anatomic site of the CNS tumor. For glioblastoma, combined modality therapy with resection, radiation, and chemotherapy is standard. Anaplastic astrocytomas, anaplastic oligodendrogliomas, and anaplastic oligoastrocytomas represent only a small proportion of CNS gliomas; therefore, phase III randomized trials restricted to these tumor types are not generally practical. The natural histories of these tumors are variable, depending on histological and molecular factors; therefore, treatment guidelines are evolving. Therapy involving surgically implanted carmustine-impregnated polymer wafers combined with postoperative external-beam radiation therapy (EBRT) may play a role in the treatment of high-grade (grades III and IV) gliomas in some patients. For most types of CNS tumors in most locations, complete or near-complete surgical removal is generally attempted, within the constraints of preserving neurologic function and the patient's underlying health. This practice is based on observational evidence that survival is better in patients who undergo tumor resection than in those who have closed biopsy alone. [2,3] The benefit of resection has not been tested in randomized trials. Selection bias can enter into observational studies despite attempts to adjust for patient differences that guide the decision to resect the tumor; therefore, the actual difference in outcome between radical surgery and biopsy alone may not be as large as noted in the retrospective studies. An exception to the use of resection is the case of deep-seated tumors such as pontine gliomas, which are diagnosed on clinical evidence and treated without initial surgery approximately 50% of the time. In most cases, however, diagnosis by biopsy is preferred. Stereotactic biopsy can be used for lesions that are difficult to reach and resect. To establish a histologic diagnosis. To reduce intracranial pressure by removing as much tumor as is safely possible to preserve neurological function. Resection proceeds until either the magnetic resonance imaging (MRI) signal abnormality being used to monitor the extent of surgery is completely removed or subtle neurologic dysfunction appears (e.g., a slight decrease in rapid alternating motor movement or anomia). When the tumor is located in or near language centers in the cortex, intraoperative language mapping can be performed by electrode discharge-induced speech arrest while the patient is asked to count or read. Large-volume hospitals had lower in-hospital mortality rates after craniotomies for primary brain tumors (odds ratio [OR], 0.75 for a tenfold higher caseload; 95% confidence interval [CI], 0.62-0.90) and after needle biopsies (OR, 0.54; 95% CI, 0.35-0.83). Although there was no specific sharp threshold in all-cause mortality outcomes between low-volume hospitals and high-volume hospitals, craniotomy-associated in-hospital mortality was 4.5% for hospitals with 5 or fewer procedures per year and 1.5% for hospitals with at least 42 procedures per year. In-hospital mortality rates decreased over the study years (perhaps because the proportion of elective nonemergent operations increased from 45% to 57%), but the decrease was more rapid in high-volume hospitals than in low-volume hospitals. High-volume surgeons had lower in-hospital patient mortality rates after craniotomy (OR, 0.60; 95% CI, 0.45-0.79). As with any study of volume-outcome associations, these results may not be causal because of residual confounding factors such as referral patterns, private insurance, and patient selection, despite multivariable adjustment. Radiation therapy has a major role in the treatment of patients with high-grade gliomas. EBRT using either 3-dimensional conformal radiation therapy (3D-CRT) or intensity-modulated radiation therapy (IMRT) is considered an acceptable technique in radiation therapy delivery. Typically used are 2- to 3-cm margins on the MRI-based volumes (T1-weighted and fluid-attenuated inversion recovery [FLAIR]) to create the planning target volume. Brachytherapy has been used to deliver high doses of radiation locally to the tumor while sparing normal brain tissue. However, this approach is technically demanding and has fallen out of favor with the advent of 3D-CRT and IMRT. The role of immediate PORT for low-grade gliomas (i.e., low-grade astrocytomas, oligodendrogliomas, and mixed oligoastrocytomas) is not as clear as in the case of high-grade tumors. The European Organisation for Research and Treatment of Cancer (EORTC) randomly assigned 311 patients with low-grade gliomas to undergo either radiation or observation in the EORTC-22845 (MRC BR04) trial. [14,15] On review of central pathology, about 25% of patients in the trial were reported to have high-grade tumors. Most of the control patients received radiation therapy at the time of progression. There was no difference in the overall survival (OS) rate (median survival = 7.4 years in the radiation arm vs. 7.2 years in the control arm; HR, 0.97; 95% CI, 0.71-1.34; P = .87). [14,15][Level of evidence: 1iiA] This was caused by a longer survival after progression in the control arm (3.4 years) than in the radiation arm (1.0 year) (P < .0001). The investigators did not collect reliable quality-of-life measurements, so it is not clear whether the delay in initial relapse in the radiation therapy arm translated into improved function or quality of life. There are no randomized trials to delineate the role of repeat radiation after disease progression or the development of radiation-induced cancers. The literature is limited to small retrospective case series, which makes interpretation difficult. The decision to repeat radiation must be made carefully because of the risk of neurocognitive deficits and radiation-induced necrosis. One advantage of radiosurgery is the ability to deliver therapeutic doses to recurrent tumors that may require the re-irradiation of previously irradiated brain tissue beyond tolerable dose limits. For many years, the nitrosourea carmustine ([bis-chloroethylnitrosourea] BCNU) was the standard chemotherapy agent added to surgery and radiation therapy for malignant gliomas, based on the Radiation Therapy Oncology Group's randomized trial (RTOG-8302). [Level of evidence: 1iiA] A modest impact on survival with the use of nitrosourea-containing chemotherapy regimens for malignant gliomas was confirmed in a patient-level meta-analysis of 12 randomized trials (combined HRdeath, 0.85; 95% CI, 0.78-0.91). The concept of delivering high doses of chemotherapy while avoiding systemic toxicity is attractive because malignant glioma-related deaths are nearly always the result of an inability to control intracranial disease rather than the result of distant metastases. A biodegradable carmustine wafer has been developed for that purpose. The wafers contain 3.85% carmustine, and up to eight wafers are implanted into the tumor bed lining at the time of open resection, with an intended total dose of about 7.7 mg per wafer (61.6 mg maximum per patient) over a period of 2 to 3 weeks. Two randomized, placebo-controlled trials of this focal drug-delivery method have shown an OS advantage associated with the carmustine wafers versus radiation therapy alone. In both trials, the upper age limit for patients was 65 years. A small trial was closed because of a lack of continued availability of the carmustine wafers after 32 patients with high-grade gliomas had been entered. Although OS was better in the carmustine-wafer group (median 58.1 vs. 39.9 weeks; P = .012), there was an imbalance in the study arms (only 11 of 16 patients in the carmustine-wafer group vs. 16 of the 16 patients in the placebo-wafer group had grade IV glioblastoma tumors). A multicenter study of 240 patients with primary malignant gliomas, 207 of whom had glioblastoma, was more informative. [25,26] At initial surgery, patients received either carmustine wafers or placebo wafers, followed by radiation therapy (55-60 Gy). Systemic therapy was not allowed until recurrence, except in the case of anaplastic oligodendrogliomas (n = 9). Unlike the initial trial, patient characteristics were well balanced between the study arms. Median survival in the two groups was 13.8 months in patients treated with carmustine wafers versus 11.6 months in placebo-treated patients (HR, 0.73; 95% CI, 0.56-0.96; P = .017). Dexamethasone, mannitol, and furosemide are used to treat the peritumoral edema associated with brain tumors. The use of anticonvulsants is mandatory for patients with seizures. Lallana EC, Abrey LE: Update on the therapeutic approaches to brain tumors. Expert Rev Anticancer Ther 3 (5): 655-70, 2003. Laws ER, Parney IF, Huang W, et al. : Survival following surgery and prognostic factors for recently diagnosed malignant glioma: data from the Glioma Outcomes Project. J Neurosurg 99 (3): 467-73, 2003. Chang SM, Parney IF, Huang W, et al. : Patterns of care for adults with newly diagnosed malignant glioma. JAMA 293 (5): 557-64, 2005. Meyer FB, Bates LM, Goerss SJ, et al. : Awake craniotomy for aggressive resection of primary gliomas located in eloquent brain. Mayo Clin Proc 76 (7): 677-87, 2001. Sanai N, Mirzadeh Z, Berger MS: Functional outcome after language mapping for glioma resection. N Engl J Med 358 (1): 18-27, 2008. Begg CB, Cramer LD, Hoskins WJ, et al. : Impact of hospital volume on operative mortality for major cancer surgery. JAMA 280 (20): 1747-51, 1998. Birkmeyer JD, Finlayson EV, Birkmeyer CM: Volume standards for high-risk surgical procedures: potential benefits of the Leapfrog initiative. Surgery 130 (3): 415-22, 2001. Barker FG 2nd, Curry WT Jr, Carter BS: Surgery for primary supratentorial brain tumors in the United States, 1988 to 2000: the effect of provider caseload and centralization of care. Neuro Oncol 7 (1): 49-63, 2005. Laperriere N, Zuraw L, Cairncross G, et al. : Radiotherapy for newly diagnosed malignant glioma in adults: a systematic review. Radiother Oncol 64 (3): 259-73, 2002. Bleehen NM, Stenning SP: A Medical Research Council trial of two radiotherapy doses in the treatment of grades 3 and 4 astrocytoma. The Medical Research Council Brain Tumour Working Party. Br J Cancer 64 (4): 769-74, 1991. Tsao MN, Mehta MP, Whelan TJ, et al. : The American Society for Therapeutic Radiology and Oncology (ASTRO) evidence-based review of the role of radiosurgery for malignant glioma. Int J Radiat Oncol Biol Phys 63 (1): 47-55, 2005. Souhami L, Seiferheld W, Brachman D, et al. : Randomized comparison of stereotactic radiosurgery followed by conventional radiotherapy with carmustine to conventional radiotherapy with carmustine for patients with glioblastoma multiforme: report of Radiation Therapy Oncology Group 93-05 protocol. Int J Radiat Oncol Biol Phys 60 (3): 853-60, 2004. Karim AB, Afra D, Cornu P, et al. : Randomized trial on the efficacy of radiotherapy for cerebral low-grade glioma in the adult: European Organization for Research and Treatment of Cancer Study 22845 with the Medical Research Council study BRO4: an interim analysis. Int J Radiat Oncol Biol Phys 52 (2): 316-24, 2002.
van den Bent MJ, Afra D, de Witte O, et al. : Long-term efficacy of early versus delayed radiotherapy for low-grade astrocytoma and oligodendroglioma in adults: the EORTC 22845 randomised trial. Lancet 366 (9490): 985-90, 2005. Paulino AC, Mai WY, Chintagumpala M, et al. : Radiation-induced malignant gliomas: is there a role for reirradiation? Int J Radiat Oncol Biol Phys 71 (5): 1381-7, 2008. Walker MD, Green SB, Byar DP, et al. : Randomized comparisons of radiotherapy and nitrosoureas for the treatment of malignant glioma after surgery. N Engl J Med 303 (23): 1323-9, 1980. Stewart LA: Chemotherapy in adult high-grade glioma: a systematic review and meta-analysis of individual patient data from 12 randomised trials. Lancet 359 (9311): 1011-8, 2002. Stupp R, Mason WP, van den Bent MJ, et al. : Radiotherapy plus concomitant and adjuvant temozolomide for glioblastoma. N Engl J Med 352 (10): 987-96, 2005. Stupp R, Hegi ME, Mason WP, et al. : Effects of radiotherapy with concomitant and adjuvant temozolomide versus radiotherapy alone on survival in glioblastoma in a randomised phase III study: 5-year analysis of the EORTC-NCIC trial. Lancet Oncol 10 (5): 459-66, 2009. Buckner JC, Pugh SL, Shaw EG, et al. : Phase III study of radiation therapy with or without procarbazine, CCNU, and vincristine (PCV) in low-grade glioma: RTOG 9802 with Alliance, ECOG, and SWOG. [Abstract] J Clin Oncol 32 (Suppl 5): A-2000, 2014.
van den Bent MJ, Brandes AA, Taphoorn MJ, et al. : Adjuvant procarbazine, lomustine, and vincristine chemotherapy in newly diagnosed anaplastic oligodendroglioma: long-term follow-up of EORTC brain tumor group study 26951. J Clin Oncol 31 (3): 344-50, 2013. Cairncross G, Wang M, Shaw E, et al. : Phase III trial of chemoradiotherapy for anaplastic oligodendroglioma: long-term results of RTOG 9402. J Clin Oncol 31 (3): 337-43, 2013. Valtonen S, Timonen U, Toivanen P, et al. : Interstitial chemotherapy with carmustine-loaded polymers for high-grade gliomas: a randomized double-blind study. Neurosurgery 41 (1): 44-8; discussion 48-9, 1997. Westphal M, Hilt DC, Bortey E, et al. : A phase 3 trial of local chemotherapy with biodegradable carmustine (BCNU) wafers (Gliadel wafers) in patients with primary malignant glioma. Neuro-oncol 5 (2): 79-88, 2003. Westphal M, Ram Z, Riddle V, et al. : Gliadel wafer in initial surgery for malignant glioma: long-term follow-up of a multicenter controlled trial. Acta Neurochir (Wien) 148 (3): 269-75; discussion 275, 2006. Hart MG, Grant R, Garside R, et al. : Chemotherapeutic wafers for high grade glioma. Cochrane Database Syst Rev (3): CD007294, 2008. Nakamura M, Roser F, Michel J, et al. : The natural history of incidental meningiomas. Neurosurgery 53 (1): 62-70; discussion 70-1, 2003. Yano S, Kuratsu J; Kumamoto Brain Tumor Research Group: Indications for surgery in patients with asymptomatic meningiomas based on an extensive experience. J Neurosurg 105 (4): 538-43, 2006. Patients with brain stem gliomas have relatively poor prognoses that correlate with histology (when biopsies are performed), location, and extent of tumor. The overall median survival time of patients in studies has been 44 to 74 weeks. Depending on the degree of anaplasia, patients with pineal astrocytomas have variable prognoses. Patients with higher-grade tumors have worse prognoses. Surgery plus radiation therapy for pineal astrocytoma. Surgery plus radiation therapy and chemotherapy for higher-grade tumors. This astrocytic tumor is classified as a World Health Organization (WHO) grade I tumor and is often curable. Surgery alone if the tumor is totally resectable. Surgery followed by radiation therapy to known or suspected residual tumor. This WHO grade II astrocytic tumor is less often curable than is a pilocytic astrocytoma. Surgery followed by radiation therapy and chemotherapy. Some physicians use surgery alone if a patient has clinical factors that are considered low risk, such as age less than 40 years and the lack of contrast enhancement on a computed tomographic scan. For patients with low-grade (WHO grade II) tumors, which are considered high risk, radiation therapy followed by six cycles of vincristine (PCV) chemotherapy is a recommended option based on the long-term follow-up results of the Radiation Therapy Oncology Group (RTOG)'s 1986-initiated randomized trial (RTOG 9802 [NCT00003375]). [Level of evidence: 1iiA] In this trial, high-risk, low-grade glioma patients, defined as patients aged 18 to 39 years with biopsy or subtotal resection, or patients aged 40 years or older, were randomly assigned to either 54 Gy of radiation therapy or radiation therapy followed by six cycles of PCV chemotherapy. The addition of PCV to radiation therapy increased median PFS from 4.0 years to 10.4 years (P = .002; hazard ratio [HR], 0.50) and median OS from 7.8 years to 13.3 years (P = .03; HR, 0.59). Notably, the RTOG 9802 study enrolled patients with a variety of tumors, including astrocytomas, oligodendrogliomas, and mixed oligoastrocytomas. In a risk-adjusted multivariate analysis, patients treated with PCV and patients with an oligodendroglial histology had better survival outcomes. A subset analysis of histologic type suggested that the addition of PCV mainly benefited patients with oligodendroglial tumors, although this data is yet to be validated. Median OS for PCV versus the control arm was not reached versus 10.8 years for oligodendrogliomas (P = .008), 11.4 years versus 5.9 years for oligoastrocytomas (P = .05), and 7.7 years versus 4.4 years for astrocytomas (P = .31). The discovery of the isocitrate dehydrogenase (IDH) 1 and IDH2 mutations in diffuse gliomas has greatly helped to identify patients who are considered high risk. A number of large, retrospective studies has demonstrated that the IDH1 and IDH2 mutation is a powerful independent prognostic factor for improved survival. [5,6,7,8,9] The majority of WHO grade II and III gliomas harbor the IDH1 and IDH2 mutation,[6,10,11] and, therefore, the presence of the IDH1 and IDH2 mutation should be included in the assessment of high risk. Molecular correlative data from the RTOG 98-02 trial, which would be informative about which patients benefited the most from the addition of PCV, have not yet been reported. Patients with anaplastic astrocytomas (WHO grade III) have a low cure rate with standard local treatment. Surgery plus radiation therapy with or without chemotherapy. A subset of anaplastic astrocytomas is aggressive; these tumors are frequently managed in the same way as glioblastomas, with surgery and radiation, and often with chemotherapy. However, the optimal treatment for these tumors is not established. Two phase III randomized trials restricted to patients with anaplastic gliomas (NCT00626990 and NCT00887146) are currently enrolling patients, but efficacy data are not available. It is not known whether the improved survival of patients with chemotherapy-treated glioblastoma can be extrapolated to patients with anaplastic astrocytomas. The IDH1 and IDH2 mutation is present in 50% to 70% of anaplastic astrocytomas and is independently associated with significantly improved survival. [6,9] Assessment of the IDH1 and IDH2 mutation status may guide decisions about treatment options. The order of the modalities did not affect time-to-treatment failure (TTF) or OS. Neither TTF nor OS differed across the treatment arms. Patients with anaplastic astrocytomas are appropriate candidates for clinical trials designed to improve local control by adding newer forms of treatment to standard treatment. Information about ongoing clinical trials is available from the NCI website. For patients with glioblastoma (WHO grade IV), the cure rate is very low with standard local treatment. Surgery plus radiation therapy and chemotherapy. Carmustine-impregnated polymer implanted during initial surgery. Radiation therapy and concurrent chemotherapy. The standard treatment for patients with newly diagnosed glioblastoma is surgery followed by concurrent radiation therapy and daily temozolomide, and then followed by six cycles of temozolomide. The addition of bevacizumab to radiation therapy and temozolomide did not improve OS. Standard therapy is based on a large, multicenter, randomized trial (NCT00006353) conducted by the EORTC and National Cancer Institute of Canada (NCIC).This trial reported a survival benefit with concurrent radiation therapy and temozolomide, compared with radiation therapy alone. [15,16][Level of evidence: 1iiA] In this study, 573 patients with glioblastoma were randomly assigned to receive standard radiation to the tumor volume with a 2- to 3-cm margin (60 Gy, 2 Gy per fraction, over 6 weeks) alone or with temozolomide (75 mg/m2 orally per day during radiation therapy for up to 49 days, followed by a 4-week break and then up to six cycles of five daily doses every 28 days at a dose of 150 mg/m2, increasing to 200 mg/m2 after the first cycle). OS was statistically significantly better in the combined radiation therapy-temozolomide group (HRdeath, 0.6; 95% confidence interval [CI], 0.5-0.7; OS at 3 years was 16.0% for the radiation therapy-temozolomide group vs. 4.4% radiation therapy-alone group). A companion molecular correlation subset study to the EORTC-NCIC trial provided strong evidence that epigenetic silencing of the MGMT DNA-repair gene by promoter DNA methylation was associated with increased OS in patients with newly diagnosed glioblastoma. MGMT promoter methylation was an independent favorable prognostic factor (P < .001 by the log-rank test; HR, 0.45; 95% CI, 0.32-0.61). The median OS for patients with MGMT methylation was 18.2 months (95% CI, 15.5-22.0), compared with 12.2 months (95% CI, 11.4-13.5) for patients without MGMT methylation. Among 833 randomly assigned patients, no statistically significant difference between standard and dose-dense temozolomide was observed for median OS (16.6 months for standard temozolomide vs. 14.9 months for dose-dense temozolomide; HR, 1.03; P = .63) or for median PFS (5.5 vs. 6.7 months; HR, 0.87; P = .06). Protracted temozolomide, which depletes intracellular MGMT, was predicted to have greater efficacy in tumors with MGMT-promoter methylation. To test this retrospectively, MGMT status was determined in 86% of randomly assigned patients. No difference in efficacy was observed in either the MGMT-methylated or MGMT-unmethylated subsets. There was no survival advantage for the use of dose-dense temozolomide versus standard-dose temozolomide in newly diagnosed glioblastoma patients, regardless of MGMT status. However, this study confirmed the strong prognostic effect of MGMT methylation because the median OS was 21.2 months (95% CI, 17.9-24.8) for patients with methylation versus 14 months (HR, 1.74; 95% CI, 12.9-14.7; P < .001) for patients without methylation. The efficacy of dose-dense temozolomide for patients who have recurrent glioblastoma, however, is yet to be determined. In 2013, final data from two multicenter, phase III, randomized, double-blind, placebo-controlled trials of bevacizumab in patients who had newly diagnosed glioblastoma were reported: RTOG 0825 (NCT00884741) and the Roche-sponsored AVAglio (NCT00943826). [17,18][Level of evidence: 1iA] Bevacizumab did not improve OS in either trial. There was significant crossover in both trials. Approximately 40% of RTOG 0825 patients and approximately 30% of AVAglio patients received bevacizumab at the first sign of disease progression. Bevacizumab did not improve OS (median OS was 16-17 months for each arm); however, it increased median PFS (10.7 months in the bevacizumab arm vs. 7.3 months in the placebo arm; HR, 0.79; P = .007). The PFS result in the RTOG 0825 trial did not meet the prespecified significance level (P = .004). Bevacizumab did not improve OS (median OS was 16-17 months for each arm); however, it increased median PFS (10.6 months in the bevacizumab arm vs. 6.2 months in the placebo arm; HR, 0.64; P < .0001). The PFS result was statistically significant and associated with clinical benefit because bevacizumab-treated patients remained functionally independent longer (9.0 months in the bevacizumab arm vs. 6.0 months in the standard therapy arm) and had a longer time until their Karnofsky Performance status deteriorated (HR, 0.65; P < .0001). Bevacizumab-treated patients also had delayed initiation of corticosteroids (12.3 months vs. 3.7 months; HR, 0.71; P = .002), and more patients were able to discontinue corticosteroids if they were already taking them (66% in the bevacizumab arm vs. 47% in the standard therapy arm). The two trials had contradictory results in health-related quality of life (HRQoL) and neurocognitive outcomes studies. In the mandatory HRQoL studies in the AVAglio trial, bevacizumab-treated patients experienced improved HRQoL, but bevacizumab-treated patients in the elective RTOG 0825 studies showed more decline in patient-reported HRQoL and neurocognitive function. The reasons for these discrepancies are unclear. On the basis of these results, there is no definite evidence that the addition of bevacizumab to standard therapy is beneficial for all newly diagnosed glioblastoma patients. Certain subgroups may benefit from the addition of bevacizumab, but this is not yet known. Glioblastoma patients are appropriate candidates for clinical trials designed to improve local control by adding newer forms of treatment to standard treatment. Information about ongoing clinical trials is available from the NCI website. Patients who have oligodendrogliomas (WHO grade II) generally have better prognoses than do patients who have diffuse astrocytomas. In particular, patients who have oligodendrogliomas with 1p/19q codeletion have a much longer survival. Most of the oligodendrogliomas eventually progress. Surgery with radiation therapy and chemotherapy. The discovery of the IDH1 and IDH2 mutations, which are independent prognostic factors for significantly improved survival in diffuse gliomas, has greatly helped to identify patients who are considered high risk. (Refer to Diffuse astrocytomas treatment in the Astrocytic Tumors Treatment section of the Treatment of Primary Central Nervous System Tumors by Tumor Type section of this summary for more information.) In addition, a high proportion of WHO grade II oligodendrogliomas have 1p/19q codeletion, which is a powerful prognostic factor for improved survival. [19,20,21] Therefore, the presence of the IDH1 and IDH2 mutation and 1p/19q codeletion should be included in the assessment of high-risk patients. Molecular correlative data from the RTOG-9802 trial, which would be informative about which patients benefited most from the addition of PCV, have not yet been reported. Patients with anaplastic oligodendrogliomas (WHO grade III) have a low cure rate with standard local treatment, but their prognoses are generally better than are the prognoses of patients with anaplastic astrocytomas. Prognoses are particularly better for patients with 1p/19q codeletion, which occurs in a majority of these tumors. Two phase III randomized trials restricted to patients with anaplastic gliomas (NCT00626990 and NCT00887146) are currently enrolling patients; however, efficacy data are not yet available. (Refer to Anaplastic astrocytomas treatment in the Astrocytic Tumors Treatment section of the Treatment of Primary Central Nervous System Tumors by Tumor Type section of this summary for more information.) These patients are appropriate candidates for clinical trials designed to improve local control by adding newer forms of treatment. Surgery plus radiation with or without chemotherapy. OS was significantly longer in the radiation therapy and PCV arm (42.3 months vs. 30.6 months; HR, 0.75; 95% CI, 0.60-0.95). Patients with 1p/19q-codeleted tumors derived more benefit from adjuvant PCV chemotherapy than did those with non-1p/19q-deleted tumors. In contrast, the RTOG trial (RTOG-9402 [NCT00002569]) demonstrated no differences in median survival by treatment arm between an 8-week, intensive PCV chemotherapy regimen followed by immediate involved-field-plus-radiation therapy and radiation therapy alone. In an unplanned subgroup analysis, patients with 1p/19q-codeleted anaplastic oligodendrogliomas and mixed anaplastic astrocytomas demonstrated a median survival of 14.7 years versus 7.3 years (HR, 0.59; 95% CI, 0.37-0.95; P = .03). Postoperative radiation therapy alone has been compared with postoperative chemotherapy alone in patients with anaplastic gliomas (including 144 astrocytomas, 91 oligoastrocytomas, and 39 oligodendrogliomas) with crossover to the other modality at the time of tumor progression. Of the 139 patients randomly assigned to undergo radiation therapy, 135 were randomly assigned to receive chemotherapy, with a 32-week course of either PCV or single-agent temozolomide (2:1:1 randomization). [Levels of evidence: 1iiA and 1iiD]. TTF or OS did not differ across the treatment arms and were not affected by the order of the modalities. The combination of radiation and chemotherapy is not known to be superior in outcome to sequential modality therapy. A high proportion of anaplastic oligodendrogliomas have the IDH1 andIDH2 mutation and 1p/19q codeletion, both powerful prognostic factors for improved survival. (Refer to Diffuse astrocytomas treatment in the Astrocytic Tumors Treatment section of the Treatment of Primary Central Nervous System Tumors by Tumor Type of this summary for more information. )[23,24] In addition, PCV chemotherapy has been shown to be predictive in a retrospective analysis of the phase III trials described earlier. Therefore, assessment of these molecular markers may aid management decisions for anaplastic oligodendrogliomas. Patients with mixed glial tumors, which include oligoastrocytoma (WHO grade II) and anaplastic oligoastrocytoma (WHO grade III), have highly variable prognoses based upon their status of the IDH1 and IDH2 genes and 1p/19q chromosomes. [27,28,29] Therefore, the optimal treatment for these tumors as a group is uncertain. Often, they are treated similarly to astrocytic tumors because a subset of tumors may have outcomes similar to WHO grade III astrocytic or WHO grade IV glioblastoma tumors. Testing for these known, strong, prognostic molecular markers should be performed, which may help to guide the assessment of risk and subsequent management. Ependymal tumors (WHO grade I) and ependymomas (WHO grade II)-i.e., subependymomas and myxopapillary ependymomas-are often curable. Patients with anaplastic ependymomas (WHO grade III) have variable prognoses that depend on the location and extent of disease. Frequently, but not invariably, patients with anaplastic ependymomas have worse prognoses than do those patients with lower-grade ependymal tumors. Surgery plus craniospinal radiation therapy for good-risk patients. Surgery plus craniospinal radiation therapy and various chemotherapy regimens are being evaluated for poor-risk patients. Pineocytomas (WHO grade II), pineoblastomas (WHO grade IV), and pineal parenchymal tumors of intermediate differentiation are diverse tumors that require special consideration. Pineocytomas are slow-growing tumors and prognosis varies. Pineoblastomas grow more rapidly and patients with these tumors have worse prognoses. Pineal parenchymal tumors of intermediate differentiation have unpredictable growth and clinical behavior. Surgery plus radiation therapy for pineocytoma. Surgery plus radiation therapy and chemotherapy for pineoblastoma. Active surveillance with deferred treatment, especially for incidentally discovered asymptomatic tumors.[33,34]. Stereotactic radiosurgery for tumors smaller than 3 cm. Surgery plus radiation therapy in selected cases, such as for patients with known or suspected residual disease or with recurrence after previous surgery. Fractionated radiation therapy for patients with unresectable tumors. The prognoses for patients with WHO grade II meningiomas (atypical, clear cell, and chordoid), WHO grade III meningiomas (anaplastic/malignant, rhabdoid, and papillary), and hemangiopericytomas are worse than the prognoses for patients with low-grade meningiomas because complete resections are less commonly feasible, and the proliferative capacity is greater. The prognoses and treatment of patients with germ cell tumors-which include germinomas, embryonal carcinomas, choriocarcinomas, and teratomas-depend on tumor histology, tumor location, presence and amount of biological markers, and surgical resectability. Craniopharyngiomas (WHO grade I) are often curable. Debulking surgery plus radiation therapy if the tumor is unresectable. Patients who have CNS tumors that are either infrequently curable or unresectable should be considered candidates for clinical trials. Information about ongoing clinical trials is available from the NCI website. Heavy-particle radiation, such as proton-beam therapy, carries the theoretical advantage of delivering high doses of ionizing radiation to the tumor bed while sparing surrounding brain tissue. The data are preliminary for this investigational technique, and are not widely available. Vascular endothelial growth factor inhibitors. Check the list of NCI-supported cancer clinical trials that are now accepting patients with adult brain tumor. The list of clinical trials can be further narrowed by location, drug, intervention, and other criteria. Kaye AH, Walker DG: Low grade astrocytomas: controversies in management. J Clin Neurosci 7 (6): 475-83, 2000. Buckner JC, Shaw E, Pugh S, et al. : R9802: Phase III study of radiation therapy with or without procarbazine, CCNU, and vincristine (PCV) in low-grade glioma: Results by histologic type. [Abstract] Neuro-Oncology 16 (Suppl 5): A-AT-13, v11, 2014. Watanabe T, Nobusawa S, Kleihues P, et al. : IDH1 mutations are early events in the development of astrocytomas and oligodendrogliomas. Am J Pathol 174 (4): 1149-53, 2009. Wick W, Hartmann C, Engel C, et al. : NOA-04 randomized phase III trial of sequential radiochemotherapy of anaplastic glioma with procarbazine, lomustine, and vincristine or temozolomide. J Clin Oncol 27 (35): 5874-80, 2009. Hegi ME, Diserens AC, Gorlia T, et al. : MGMT gene silencing and benefit from temozolomide in glioblastoma. N Engl J Med 352 (10): 997-1003, 2005. Gilbert MR, Wang M, Aldape KD, et al. : Dose-dense temozolomide for newly diagnosed glioblastoma: a randomized phase III clinical trial. J Clin Oncol 31 (32): 4085-91, 2013. Gilbert MR, Dignam JJ, Armstrong TS, et al. : A randomized trial of bevacizumab for newly diagnosed glioblastoma. N Engl J Med 370 (8): 699-708, 2014. Chinot OL, Wick W, Mason W, et al. : Bevacizumab plus radiotherapy-temozolomide for newly diagnosed glioblastoma. N Engl J Med 370 (8): 709-22, 2014. Fallon KB, Palmer CA, Roth KA, et al. : Prognostic value of 1p, 19q, 9p, 10q, and EGFR-FISH analyses in recurrent oligodendrogliomas. J Neuropathol Exp Neurol 63 (4): 314-22, 2004. Smith JS, Perry A, Borell TJ, et al. : Alterations of chromosome arms 1p and 19q as predictors of survival in oligodendrogliomas, astrocytomas, and mixed oligoastrocytomas. J Clin Oncol 18 (3): 636-45, 2000. Okamoto Y, Di Patre PL, Burkhard C, et al. : Population-based study on incidence, survival rates, and genetic alterations of low-grade diffuse astrocytomas and oligodendrogliomas. Acta Neuropathol 108 (1): 49-56, 2004.
van den Bent MJ, Chinot O, Boogerd W, et al. : Second-line chemotherapy with temozolomide in recurrent oligodendroglioma after PCV (procarbazine, lomustine and vincristine) chemotherapy: EORTC Brain Tumor Group phase II study 26972. Ann Oncol 14 (4): 599-602, 2003. Gilbert MR: Minding the Ps and Qs: perseverance and quality studies lead to major advances in patients with anaplastic oligodendroglioma. J Clin Oncol 31 (3): 299-300, 2013. Brada M, Stenning S, Gabe R, et al. : Temozolomide versus procarbazine, lomustine, and vincristine in recurrent high-grade glioma. J Clin Oncol 28 (30): 4601-8, 2010. Jiao Y, Killela PJ, Reitman ZJ, et al. : Frequent ATRX, CIC, FUBP1 and IDH1 mutations refine the classification of malignant gliomas. Oncotarget 3 (7): 709-22, 2012. Killela PJ, Reitman ZJ, Jiao Y, et al. : TERT promoter mutations occur frequently in gliomas and a subset of tumors derived from cells with low rates of self-renewal. Proc Natl Acad Sci U S A 110 (15): 6021-6, 2013. Killela PJ, Pirozzi CJ, Healy P, et al. : Mutations in IDH1, IDH2, and in the TERT promoter define clinically distinct subgroups of adult malignant gliomas. Oncotarget 5 (6): 1515-25, 2014. Oya N, Shibamoto Y, Nagata Y, et al. : Postoperative radiotherapy for intracranial ependymoma: analysis of prognostic factors and patterns of failure. J Neurooncol 56 (1): 87-94, 2002. Brandes AA, Ermani M, Amista P, et al. : The treatment of adults with medulloblastoma: a prospective study. Int J Radiat Oncol Biol Phys 57 (3): 755-61, 2003. Brandes AA, Franceschi E, Tosoni A, et al. : Long-term results of a prospective study on the treatment of medulloblastoma in adults. Cancer 110 (9): 2035-41, 2007. Debus J, Wuendrich M, Pirzkall A, et al. : High efficacy of fractionated stereotactic radiotherapy of large base-of-skull meningiomas: long-term results. J Clin Oncol 19 (15): 3547-53, 2001. Fine HA: Promising new therapies for malignant gliomas. Cancer J 13 (6): 349-54, 2007 Nov-Dec.
Fecci PE, Mitchell DA, Archer GE, et al. : The history, evolution, and clinical use of dendritic cell-based immunization strategies in the therapy of brain tumors. J Neurooncol 64 (1-2): 161-76, 2003 Aug-Sep.
Newton HB: Molecular neuro-oncology and development of targeted therapeutic strategies for brain tumors. Part 1: Growth factor and Ras signaling pathways. Expert Rev Anticancer Ther 3 (5): 595-614, 2003. Kew Y, Levin VA: Advances in gene therapy and immunotherapy for brain tumors. Curr Opin Neurol 16 (6): 665-70, 2003. Chiocca EA, Aghi M, Fulci G: Viral therapy for glioblastoma. Cancer J 9 (3): 167-79, 2003 May-Jun. Surgery and radiation therapy are the primary modalities used to treat tumors of the spinal axis; therapeutic options vary according to the histology of the tumor. The experience with chemotherapy for primary spinal cord tumors is limited; no reports of controlled clinical trials are available for these types of tumors. [1,2] Chemotherapy is indicated for most patients with leptomeningeal involvement from a primary or metastatic tumor and positive cerebrospinal fluid cytology. Most patients require treatment with corticosteroids, particularly if they are receiving radiation therapy. Patients who have spinal axis tumors that are either infrequently curable or unresectable should be considered candidates for clinical trials. Information about ongoing clinical trials is available from the NCI website. Cancer of unknown primary (1%-18%). Eighty percent of brain metastases occur in the cerebral hemispheres, 15% occur in the cerebellum, and 5% occur in the brain stem. Metastases to the brain are multiple in more than 70% of cases, but solitary metastases also occur. Brain involvement can occur with cancers of the nasopharyngeal region by direct extension along the cranial nerves or through the foramina at the base of the skull. Dural metastases may constitute as much as 9% of total brain metastases. Diagnostic procedures, including a contrast MRI of the brain. A physical examination may show objective neurological findings or only minor cognitive changes. The presence of multiple lesions and a high predilection of primary tumor metastasis may be sufficient to make the diagnosis of brain metastasis. A lesion in the brain should not be assumed to be a metastasis just because a patient has had a previous cancer; such an assumption could result in overlooking appropriate treatment of a curable tumor. Computed tomography scans with contrast or MRIs with gadolinium are quite sensitive in diagnosing the presence of metastases. Positron emission tomography scanning and spectroscopic evaluation are new strategies to diagnose cerebral metastases and to differentiate the metastases from other intracranial lesions. In the case of a solitary lesion or a questionable relationship to the primary tumor, a brain biopsy (via resection or stereotactic biopsy) may be necessary. Because most cases of brain metastases involve multiple metastases, a mainstay of therapy has historically been whole-brain radiation therapy (WBRT); however, stereotactic radiosurgery has come into increasingly common use. The role of radiosurgery continues to be defined. Stereotactic radiosurgery in combination with WBRT has been assessed. Surgery is indicated to obtain tissue from a metastasis with an unknown primary tumor or to decompress a symptomatic dominant lesion that is causing significant mass effect. Chemotherapy is usually not the primary therapy for most patients; however, it may have a role in the treatment of patients with brain metastases from chemosensitive tumors and can even be curative when combined with radiation for metastatic testicular germ cell tumors. [1,6] Intrathecal chemotherapy is also used for meningeal spread of metastatic tumors. About 10% to 15% of patients with cancer will have a single brain metastasis. Radiation therapy is the mainstay of palliation for these patients. The extent of extracranial disease can influence treatment of the brain lesions. In the presence of extensive active systemic disease, surgery provides little benefit for overall survival (OS). In patients with stable minimal extracranial disease, combined modality treatment may be considered, using surgical resection followed by radiation therapy. However, the published literature does not provide clear guidance. WBRT with or without surgical resection. WBRT with or without stereotactic radiosurgery. Focal therapy alone (surgical resection or stereotactic radiosurgery). Three randomized trials examined resection of solitary brain metastases followed by WBRT versus WBRT alone, totaling 195 randomly assigned patients. [7,8,9] The process that necessarily goes into selecting appropriate patients for surgical resection may account for the small numbers in each trial. In the first trial,[Level of evidence: 1iiD] performed at a single center, all patients were selected and operated upon by one surgeon. The first two trials showed an improvement in survival in the surgery group,[7,8] but the third trial showed a trend in favor of the WBRT-only group. The combined analysis did not show a statistically significant difference in OS (hazard ratio [HR] = 0.72; 95% confidence interval [CI], 0.34-1.53; P = .4); or in death from neurologic causes (relative riskdeath = 0.68; 95% CI, 0.43-1.09; P = .11). None of the trials assessed or reported quality of life. The need for WBRT after resection of solitary brain metastases has been studied. Patients were randomly assigned to either undergo postoperative WBRT or receive no further treatment after resection. Patients in the WBRT group were less likely to have tumor progression in the brain and were significantly less likely to die of neurological causes. OS was the same in each group, and there was no difference in duration of functional independence. One additional randomized study of observation versus WBRT after either surgery or stereotactic radiosurgery for solitary brain metastases was closed after 19 patients had been entered because of slow accrual; therefore, little can be deduced from the trial. Mean OS in the combined-therapy group was 5.7 months, and mean OS in the WBRT-alone group was 6.5 months (P = .14). In the subgroup with solitary metastases, OS was better in the combined-therapy group (6.5 months vs. 4.9 months; P = .039 in univariate analysis; P = .053 in a multivariable analysis adjusting for baseline prognostic factors). In patients with multiple metastases, survival was 5.8 months in the combined-therapy group versus 6.7 months in the WBRT-only group (P = .98). The combined-treatment group had a survival advantage of 2.5 months in patients with a single metastasis but not in patients with multiple lesions. Local control was better in the full population with combined therapy. At the 6-month follow-up, Karnofsky Performance status (considered a soft endpoint because of its imprecision and subjectivity) was better in the combined-therapy group, but there was no difference in mental status between the treatment groups. Acute and late toxicities were similar in both treatment arms. Quality of life was not assessed. Health-related quality of life was improved in the observation-only arm, compared with WBRT. Patients in the observation arm had better mean scores in physical, role, and cognitive functioning at 9 months. In an exploratory analysis, statistically significant worse scores for bladder control, communication deficit, drowsiness, hair loss, motor dysfunction, leg weakness, appetite loss, constipation, nausea/vomiting, pain, and social functioning were observed in patients who underwent WBRT, compared with those who underwent observation only. Patients in the WBRT plus stereotactic radiosurgery group had decreased local failure, compared with patients who received WBRT alone (HR, 0.27; 95% CI, 0.14-0.52). Unchanged or improved Karnofsky Performance status at 6 months was seen in 43% of patients in the combined-therapy group versus only 28% in the WBRT-alone group (P = .03). Given this body of information, focal therapy plus WBRT or focal therapy alone, with close follow-up with serial MRIs and initiation of salvage therapy when clinically indicated, appear to be reasonable treatment options. The pros and cons of each approach should be discussed with the patient. Studies consistently show that the addition of WBRT to focal therapy decreases the risk of progression and new metastases in the brain. The addition of WBRT does not improve OS. The decrease in risk of intracranial disease progression does not translate into improved functional or neurologic status, nor does it appear to decrease the risk of death from neurologic deterioration. About half or more of the patients who receive focal therapy alone ultimately require salvage therapy, such as WBRT or radiosurgery, compared with about a quarter of the patients who are given up-front WBRT. The impact of better local control associated with WBRT on quality of life has not been reported and remains an open question. Diagnosis includes a combination of neurospinal axis imaging and cerebrospinal fluid (CSF) cytology. Median OS is in the range of 10 to 12 weeks. Intrathecal chemotherapy and systemic chemotherapy. Intrathecal chemotherapy and radiation therapy. In a series of 149 patients with metastatic non-small cell lung carcinoma, cytologically proven LC, poor performance status, high protein level in the CSF, and a high initial CSF white blood cell count were significant poor prognostic factors for survival. Patients received active treatment, including intrathecal chemotherapy, WBRT, or epidermal growth factor receptor-thymidine kinase-1, or underwent a ventriculoperitoneal shunt procedure. Human epidermal growth factor receptor 2 (HER2)-positive (26.3%). Triple-negative breast cancer subtype (23.7%). Patients with triple-negative breast cancer had a shorter interval between metastatic breast cancer diagnosis and the development of LC. Median survival did not differ across breast cancer subtypes. Consideration of intrathecal administration of trastuzumab in patients with HER2-positive LC has also been described in case reports. Patchell RA: The management of brain metastases. Cancer Treat Rev 29 (6): 533-40, 2003. Schaefer PW, Budzik RF Jr, Gonzalez RG: Imaging of cerebral metastases. Neurosurg Clin N Am 7 (3): 393-423, 1996. Soffietti R, Cornu P, Delattre JY, et al. : EFNS Guidelines on diagnosis and treatment of brain metastases: report of an EFNS Task Force. Eur J Neurol 13 (7): 674-81, 2006. Ogawa K, Yoshii Y, Nishimaki T, et al. : Treatment and prognosis of brain metastases from breast cancer. J Neurooncol 86 (2): 231-8, 2008. Patchell RA, Tibbs PA, Walsh JW, et al. : A randomized trial of surgery in the treatment of single metastases to the brain. N Engl J Med 322 (8): 494-500, 1990. Vecht CJ, Haaxma-Reiche H, Noordijk EM, et al. : Treatment of single brain metastasis: radiotherapy alone or combined with neurosurgery? Ann Neurol 33 (6): 583-90, 1993. Mintz AH, Kestle J, Rathbone MP, et al. : A randomized trial to assess the efficacy of surgery in addition to radiotherapy in patients with a single cerebral metastasis. Cancer 78 (7): 1470-6, 1996. Patchell RA, Tibbs PA, Regine WF, et al. : Postoperative radiotherapy in the treatment of single metastases to the brain: a randomized trial. JAMA 280 (17): 1485-9, 1998. Roos DE, Wirth A, Burmeister BH, et al. : Whole brain irradiation following surgery or radiosurgery for solitary brain metastases: mature results of a prematurely closed randomized Trans-Tasman Radiation Oncology Group trial (TROG 98.05). Radiother Oncol 80 (3): 318-22, 2006. Andrews DW, Scott CB, Sperduto PW, et al. : Whole brain radiation therapy with or without stereotactic radiosurgery boost for patients with one to three brain metastases: phase III results of the RTOG 9508 randomised trial. Lancet 363 (9422): 1665-72, 2004. Soffietti R, Kocher M, Abacioglu UM, et al. : A European Organisation for Research and Treatment of Cancer phase III trial of adjuvant whole-brain radiotherapy versus observation in patients with one to three brain metastases from solid tumors after surgical resection or radiosurgery: quality-of-life results. J Clin Oncol 31 (1): 65-72, 2013. Patil CG, Pricola K, Sarmiento JM, et al. : Whole brain radiation therapy (WBRT) alone versus WBRT and radiosurgery for the treatment of brain metastases. Cochrane Database Syst Rev 9: CD006121, 2012. Chang EL, Wefel JS, Hess KR, et al. : Neurocognition in patients with brain metastases treated with radiosurgery or radiosurgery plus whole-brain irradiation: a randomised controlled trial. Lancet Oncol 10 (11): 1037-44, 2009. Aoyama H, Shirato H, Tago M, et al. : Stereotactic radiosurgery plus whole-brain radiation therapy vs stereotactic radiosurgery alone for treatment of brain metastases: a randomized controlled trial. JAMA 295 (21): 2483-91, 2006. Kocher M, Soffietti R, Abacioglu U, et al. : Adjuvant whole-brain radiotherapy versus observation after radiosurgery or surgical resection of one to three cerebral metastases: results of the EORTC 22952-26001 study. J Clin Oncol 29 (2): 134-41, 2011. Lee SJ, Lee JI, Nam DH, et al. : Leptomeningeal carcinomatosis in non-small-cell lung cancer patients: impact on survival and correlated prognostic factors. J Thorac Oncol 8 (2): 185-91, 2013. Torrejón D, Oliveira M, Cortes J, et al. : Implication of breast cancer phenotype for patients with leptomeningeal carcinomatosis. Breast 22 (1): 19-23, 2013. Bartsch R, Berghoff AS, Preusser M: Optimal management of brain metastases from breast cancer. Issues and considerations. CNS Drugs 27 (2): 121-34, 2013. Patients who have recurrent CNS tumors are rarely curable and should be considered candidates for clinical trials. Information about ongoing clinical trials is available from the NCI website. Carmustine wafers have been investigated for the treatment of recurrent malignant gliomas, but the impact on survival is less clear than at the time of initial diagnosis and resection. In a multicenter randomized, placebo-controlled trial, 222 patients with recurrent malignant primary brain tumors requiring reoperation were randomly assigned to receive implanted carmustine wafers or placebo biodegradable wafers. [Level of evidence: 1iA] Approximately half of the patients had received prior systemic chemotherapy. The two treatment groups were well balanced at baseline. Median survival was 31 weeks in the group receiving carmustine wafers versus 23 weeks in the group receiving placebo wafers. The statistical significance between the two overall survival curves depended on the method of analysis. A Cochrane Collaboration systematic review of chemotherapeutic wafers for high-grade glioma focused on the unadjusted analysis and reported the same trial as negative. Systemic therapy (e.g., temozolomide, lomustine, or the combination of procarbazine, a nitrosourea, and PCV in patients who have not previously received the drugs) has been used at the time of recurrence of primary malignant brain tumors. However, this approach has not been tested in controlled studies. Patient-selection factors likely play a strong role in determining outcomes, so the impact of therapy on survival is not clear. In 2009, the U.S. Food and Drug Administration (FDA) granted accelerated approval of bevacizumab monotherapy for patients with progressive glioblastoma. The indication was granted under the FDA's accelerated approval program that permits the use of certain surrogate endpoints or an effect on a clinical endpoint other than survival or irreversible morbidity as bases for approvals of products intended for serious or life-threatening illnesses or conditions. The approval was based on the demonstration of improved objective response rates observed in two historically controlled, single-arm, or noncomparative phase II trials. [3,4][Level of evidence: 3iiiDiv] On the basis of these data and FDA approval, bevacizumab monotherapy has become standard therapy for recurrent glioblastoma. The FDA independently reviewed an open-label, multicenter, noncomparative phase II study that randomly assigned 167 recurrent glioblastoma multiforme (GBM) patients to receive bevacizumab alone or bevacizumab in combination with irinotecan, although only efficacy data from the bevacizumab monotherapy arm (n = 85) were used to support drug approval. Tumor responses were observed in 26% of patients treated with bevacizumab alone, and the median duration of response in these patients was 4.2 months. On the basis of this externally controlled trial, the incidence of adverse events associated with bevacizumab did not appear to be significantly increased in GBM patients. The FDA independently assessed another single-arm, single-institution trial in which 56 recurrent glioblastoma patients were treated with bevacizumab alone. Responses were observed in 20% of patients, and the median duration of response was 3.9 months. Currently, however, no data are available from prospective, randomized controlled trials demonstrating improvement in health outcomes, such as disease-related symptoms or increased survival with the use of bevacizumab to treat glioblastoma. Because there are no randomized trials, the role of repeat radiation after disease progression or the development of radiation-induced cancers is also ill defined. Interpretation is difficult because the literature is limited to small retrospective case series. The decision must be made carefully because of the risk of neurocognitive deficits and radiation necrosis. Re-resection of recurrent CNS tumors is used for some patients. However, most patients do not qualify because of a deteriorating condition or technically inoperable tumors. The evidence is limited to noncontrolled studies and case series of patients who are healthy enough and have tumors that are small enough to technically debulk. The impact on survival of reoperation versus patient selection is not known. Check the list of NCI-supported cancer clinical trials that are now accepting patients with recurrent adult brain tumor. The list of clinical trials can be further narrowed by location, drug, intervention, and other criteria. Brem H, Piantadosi S, Burger PC, et al. : Placebo-controlled trial of safety and efficacy of intraoperative controlled delivery by biodegradable polymers of chemotherapy for recurrent gliomas. The Polymer-brain Tumor Treatment Group. Lancet 345 (8956): 1008-12, 1995. Friedman HS, Prados MD, Wen PY, et al. : Bevacizumab alone and in combination with irinotecan in recurrent glioblastoma. J Clin Oncol 27 (28): 4733-40, 2009. Kreisl TN, Kim L, Moore K, et al. : Phase II trial of single-agent bevacizumab followed by bevacizumab plus irinotecan at tumor progression in recurrent glioblastoma. J Clin Oncol 27 (5): 740-5, 2009. Updated statistics with estimated new cases and deaths for 2017 (cited American Cancer Society as reference 2). This PDQ cancer information summary for health professionals provides comprehensive, peer-reviewed, evidence-based information about the treatment of adult central nervous system tumors. It is intended as a resource to inform and assist clinicians who care for cancer patients. It does not provide formal guidelines or recommendations for making health care decisions.